If you ever read Lacquered Life, you know that Tom Scheerer is one of my favorite decorators. I love his use of color and pattern and how rooms can feel extremely casual but so well executed that they read formal. He actually lived in Charleston for a time, and then gave it up in favor of the Caribbean. Funny, he did the exact opposite of Charleston’s early settlers from yesterdays post. One of the themes in Scheerer’s decorating is the use of bird prints, and I love them. 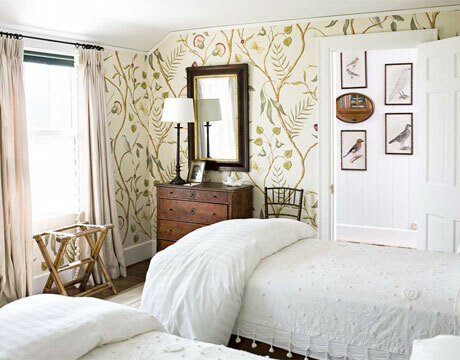 They are not an obvious choice for chic wall art – if you say, “how about a bird print?” as a suggestion for wall decor in a room, I’m sure that ones mind immediately goes to kitschy duck prints in otherwise outdated and “grandparent-like” studys. But this is the antithesis of what Scheerer is doing with birds. In clusters of varying sizes, with simple frames, these birds become more of a statement than one could ever imagine. Here again in an entry hall, Scheerer uses the birds to make a really fabulous gallery wall that is both simple and unique. And again in this stair hall. This is where I want to use birds in our house. I think a bunch of different birds would look great going up the stairs. The question is – where does he get all these birds? They cannot all be antiques – and he frames them all in mahogany bamboo frames! It is a signature move of his. I love his bird prints specifically because of their blank backgrounds and the sitting positions that all of the birds are in. So many bird prints have birds diving and playing and hunting with scenes in the background, which is not nearly as cool as the prints that Scheerer has. So does anyone have any suggestions on where to find prints like these? I could use the help! Thoughts?